The time has come, everyone. My semester is over and with that comes the end of this blog. While I would love to continue to write fun stories and find awesome recipes for everyone that has visited this blog, I simply do not have the time to dedicate to it. I had a great time writing this blog during the past four months. I learned so many new things about cupcakes and was able to spend time researching recipes and talking to people who have a passion for making amazing cupcakes. It was truly wonderful getting to know all of the wonderful people who helped contribute to this blog and I have to thank them for helping me and giving me a chance to see the cupcake world from their point of view. I hope you all enjoyed reading this blog as much as I enjoyed writing it. It sure was a sweet ride and I will definitely miss all of the comments and nice things everyone had to say. Keep trying new recipes and go visit the few shops and bakers I featured here on my blog. Their dedication and skills are worth discovering for yourself! 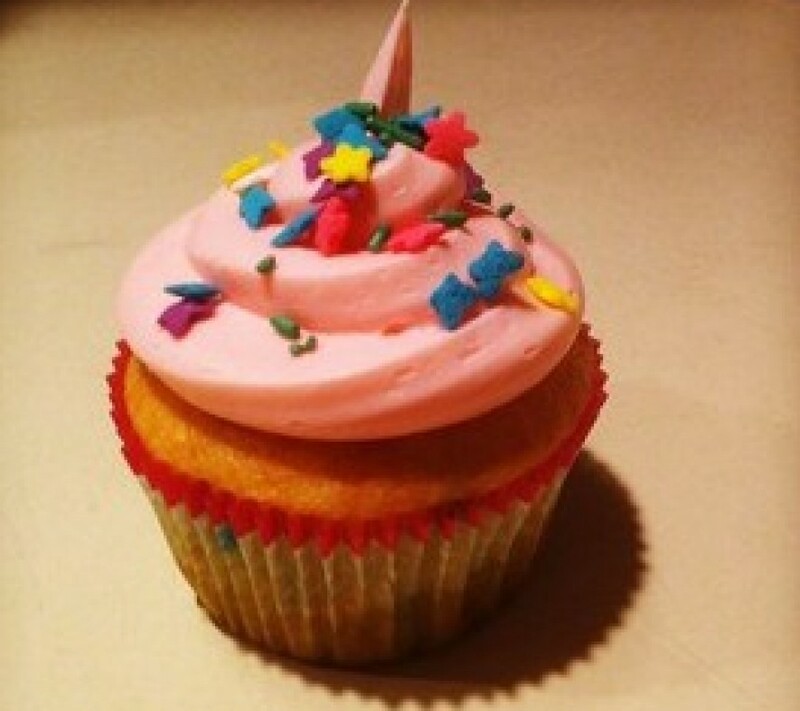 I hope this blog inspired you to bake fun cupcakes and helped you see the sweet side of life. With Springtime weather coming into town recently, I thought it would be a good idea to give my followers something extra sweet to bake! This list is complied of cupcakes that are baked with lemon flavors! To me, lemons are fresh and zesty, which is symbolic of the Spring season! For those of you who enjoy fruity flavors, these cupcakes will be perfect to try over the weekend! First up are Lemon Lover Cupcakes with Lemon Cream Cheese Icing from My Baking Addiction. These cupcakes feature a fresh, lemony flavor and they are paired with a sweet cream cheese icing. The combination provides for a mouthwatering taste. The recipe features lemon extract for flavor and if you want to get technical, you can add some yellow food dye for a visually appealing pale yellow color. Next are Apricot Lemon Cupcakes from The Tolerant Vegan. These cupcakes are baked with apricot flavors and a slight lemony taste and feature healthy, vegan ingredients. 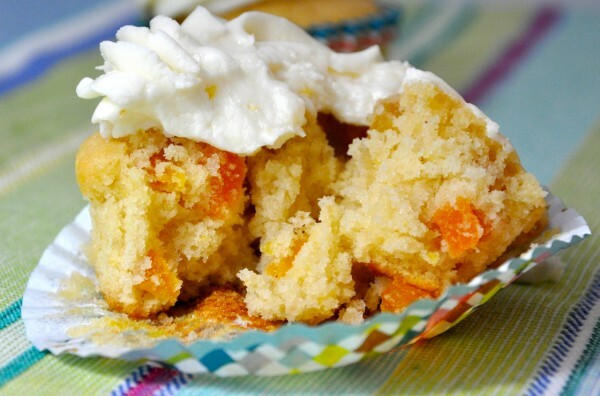 The cupcakes have pieces of apricot inside them for an extra burst of fruity flavor! 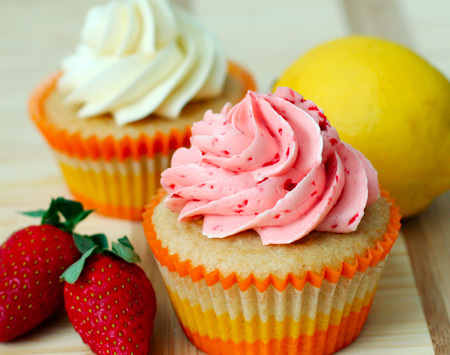 Lastly are Strawberry Lemonade Cupcakes from Love and Olive Oil. Strawberry Lemonade is a staple in my home during the warmer months and I can only imagine how wonderful the drink tastes in cupcake form. What makes these cupcakes so enticing is the icing, which is made with fresh strawberries. The cupcakes are filled with the freshness of lemon zest, making the flavor combination fruity and delicious. 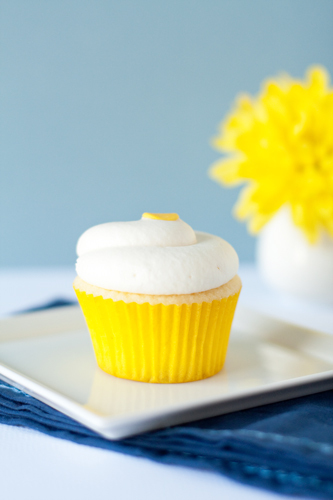 I hope you all enjoy these fresh, lemony cupcakes over the weekend and if you’re experiencing April showers, these cupcakes are sure to brighten your day! After a long week, there’s nothing more relaxing than keeping things simple. 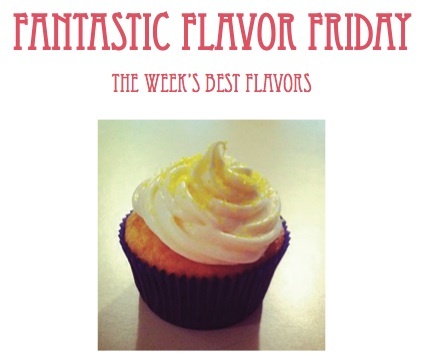 This week, SJ Cupcake is featuring classic, simple cupcake recipes for you to try over the weekend. Red Velvet cupcakes with cream cheese icing have become a staple in the cupcake world over the past few years. Brown Eyed Baker features a delicious and easy recipe for the classic flavor that will surely be a hit no matter who you serve these to. With hundreds of Chocolate cupcake recipes out there and each recipe claiming to be the best, it’s hard to decide which one is really worth trying. Since the theme of this week is simplicity, I chose Baking Bites’ recipe, which features the simplest of ingredients. If chocolate is one of your weaknesses, definitely give this easy recipe a try. Considering Vanilla cupcakes are my personal favorite, I am constantly making them for all different occasions. Some recipes are better than others, of course, but after trying this recipe from Baked Bree a few weeks ago, I discovered that this simple recipe works best. The greatest thing about vanilla cupcakes is you have endless possibilities for what flavor the icing can be. While Strawberry isn’t always everyone’s favorite flavor, it’s a definite classic and when done right, it’s downright delicious. My Baking Addiction features a healthy and quite simple strawberry cupcake recipe that will make this cold, winter weekend feel a little bit brighter. Carrot cake is a classic flavor found in most bakeries and cupcakeries are no exception. The Comfort of Cooking has a fairly simple recipe for this timeless flavor. Try it and see how easy it really is. Hopefully these recipes give you something easy and delicious to try and help you remember why sometimes it’s good to go back to basics. Enjoy the cupcakes and take pictures if you try them! Look out for my first interview with a local cupcake shop, My Little Kupkake in Collingswood. Have a great weekend! Hey guys! Over the next few weeks I’m hoping to get a lot of things accomplished with this blog. For starters, I’m planning on visiting a bunch of local cupcake bakeries to get a chance to sit down with the owners or employees to see what it takes to run a cupcake shop and to get some first-hand tips on cupcake baking. I’m really interested in hearing what people in the cupcake business have to say about the cupcake craze that’s swept the nation over the past few years. I’d love to know why they think it’s happened and if they think the craving for cupcakes is here to stay. Cupcake Bakeries tend to have a “cutesy” feel to them, so I’d like to go out and find the one that has the most welcoming and “sweet” look to it. Keep your eyes peeled for photos from my favorite cupcakeries in the area. If anyone has any suggestions of good cupcake shops in the South Jersey area, feel free to let me know. I’m more than willing to try new places and report on them. Hello! My name is Victoria Converse. I’m a junior, Public Relations major at Rowan University. This semester, I am taking an Online Journalism class that is allowing me to spend the next 15 weeks exploring something I’m interested in. I chose to blog about cupcakes because over the past few years, I’ve discovered I have a love for baking cupcakes and would ultimately love to open my own cupcake bakery at some point in my life. The purpose of this blog is to get an inside look at the art of cupcake baking by visiting local bakeries and interviewing the owners and employees. I hope to gain insight as to what goes into having your own bakery, how to create the perfect cupcake and why the cupcake craze has exploded all over the country. I also plan to come up with my own recipes and how-to tips for novice bakers, like myself. Check out my Twitter account and see what else is happening in the world of cupcakes. I’m very excited to go on this cupcake journey and I’m hoping that at the end of these 15 weeks, life will be a little sweeter.